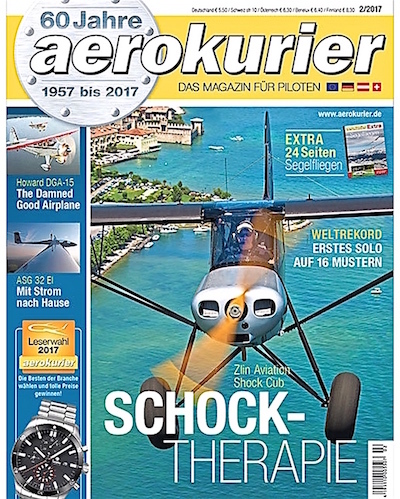 We really appreciated this new German cover and the nice "cover story"...This cover has to be added to the previous two ones we got recently : Lotniczy Aviation Revue (Poland) and Flynytt (Norway). By the end of the month there will be the first official test flight made by a very well known magazine with a Shock Cub Turbo going soon to Alaska, while the first new Rotax 915 is ready to be fitted in one our prototype..Probably the Shock Cub is playing a new interesting role in this hyper specialistic market? with more than 30 planes sold in 9 months (29 rtf plus 1 kit) it seems that we are in the right track..By the current February we will deliver from 2 up to 3 ready to fly Shock, each month during the whole 2017.Not forgetting of course the several Savage Cub-Classic, Cruiser and Bobber under delivery or just under production.We are even considering the development of the KIT market. The first Shock Cub kit will be delivered to our Czech dealer (the aerobatic pilot "Marek Hyka") by the end of the month. After this experience we will decide how to promote this formula at best.